This recipe is one of our favorites from our friend, Nancy Fox, of SkinnyKitchen.com. Here’s an easy low carb Asian restaurant favorite to make. You’ll love the crunch of the lettuce, the slightly saltiness of the soy sauce and the ever so sweet richness of the hoisin sauce and ginger, in these tasty wraps. This dish is great as a appetizer or light main course lunch or dinner. I’ve made these skinny by browning the chicken without oil and draining the fat after browning. To cut the sodium, I used reduced-sodium soy sauce and rinsed the water chestnuts in water to remove most of the sodium. The rest of the ingredients are mostly the same as a regular recipe. Each wrap has only 62 calories, 2 grams of fat and 2 Weight Watchers POINTS PLUS. Enjoy 3 of them for dinner at 186 calories, 6 grams of fat and 5 Weight Watchers POINTS PLUS. I’ve compared mine to P.F. 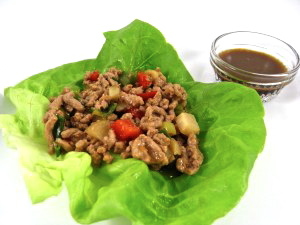 Chang’s Chicken in Soothing Lettuce Wraps which contains 153 calories and 7 grams of fat. This recipe’s a real keeper! 1. In a large pan, brown the ground chicken over medium-high heat, breaking up the pieces. Pour into a colander, in the sink and drain fat. Return chicken to pan. When cool enough to handle, break up the chicken pieces until minced. 3. In a small bowl, add all the dipping sauce ingredients and mix well. 4. To assemble each chicken wrap: Spoon about ⅓ cup of chicken filling onto one lettuce leaf and roll it up, if desired. Serve with dipping sauce on the side. This sauce is quite strong. You’ll only need 1 teaspoon of sauce per wrap. You can also set up the components on individual plates and serve family style. Let everyone make their own wrap. P.F. Chang’s Chicken in Soothing Lettuce Wraps has become their signature dish. Whenever a recipe calls for browning ground chicken, turkey or beef follow this easy step. After browning the meat, pour into a colander in the sink and drain off the fat. Just using this simple step will cut the calories and fat way down. It won’t compromise the taste either. This lettuce wrap is a perfect low carb dish. To save time. I like to use ginger, in a jar, and garlic, in a jar. Both can be found in the produce section of the supermarket. Hoisin sauce can be found in the Asian section of most supermarkets.